This bust of Miltiades is nearly contemporary. Tyrant of the Thracian Chersonese. 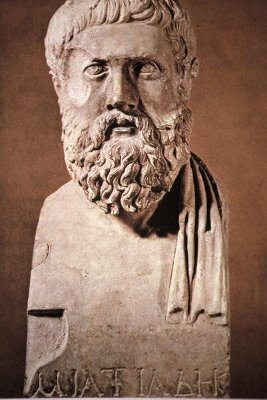 His son Cimon or Kimon rose to be a great man in Athenian politics. Probably Miltiades was the author of the Athenian victory of Marathon, but Miltiades was a complex man, a pirate, a warlord, and a supporter of Athenian democracy. He became a vassal of Darius I of Persia, joining Darius’ expedition against the Scythians around 513 BC (thus serving alongside Histaeus and probably Hipponax, Heraclitus, Aristagoras, and possibly Artaphernes…a small world!). He joined the Ionian Revolt of 499 BC against Persian rule, establishing friendly relations with Athens and capturing the islands of Lemnos and Imbros (which he eventually ceded to Athens). However, the revolt collapsed in 494 BC and in 492 BC Miltiades fled to Athens to escape a retaliatory Persian invasion. His son Metiochos was captured by the Persians and made a lifelong prisoner, but was nonetheless treated honourably as a de facto member of the Persian nobility. Arriving in Athens, Miltiades initially faced a hostile reception for his tyrannical rule in the Chersonese. Having spent three years in prison, he was sentenced to death for the crime of tyranny. However, he successfully presented himself as a defender of Greek freedoms against Persian despotism and escaped punishment. He was elected to serve as one of the 10 generals (strategoi) for 490 BC. He is often credited with devising the tactics that defeated the Persians in the Battle of Marathon later that year. 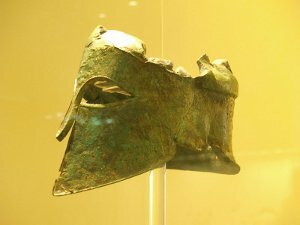 This helmet is one Miltiades sent from Marathon to Olympia as spoils of the contest there. The name “Miltiades” derives from “μίλτος” (miltos), a red ochre clay used as paint. It was a name often given to red-haired babies. It was Miltiades’s father’s name as well. He may not have had red hair!